If you’re looking for activities for kids with ADHD that help burn off energy to help them find their way back to a place of calm for greater focus and concentration, you’ve come to the right place! These activities are suitable for ALL children, particularly those who need constant movement, and can be enjoyed as a family or amongst siblings. We’ve included both indoor and outdoor activities, which can be used in the classroom, at home, during recess, and in the backyard to help kids get their wiggles out while simultaneously helping them develop their communication, socialization, gross, and fine motor skills. Attention Deficit Hyperactivity Disorder is a medical condition that causes disruptions in a child’s ability to sit still, pay attention, and exercise appropriate self-control. ADHD isn’t typically diagnosed until a child begins school as this is when parents and teachers can really assess if a child’s symptoms interfere with their ability to focus in the classroom and complete their schoolwork. ADHD tends to be more common in boys than girls, can persist into adulthood, and can have negative consequences in school, at home, in relationships, in the workforce, and beyond. There are 3 main types of ADHD – Inattentive Type, Hyperactive/Impulsive Type, and Combined Type – with Combined Type being the most commonly diagnosed. Keep in mind that most young children struggle with self-control and find it difficult to sit still and follow directions, and it isn’t until these symptoms significantly impair a child’s life at school and at home that an ADHD diagnosis is pursued. Before we dive into our favorite activities for kids with ADHD, there are a few things all parents and teachers should be aware of when it comes to understanding and helping a child with attention deficit hyperactivity disorder. Girls present ADHD symptoms differently than boys. While boys are prone to the hyperactive and impulsive symptoms of ADHD, girls tend to struggle more with inattentiveness. And since the symptoms of ADHD tend to be more subtle in girls than in boys, it often goes undiagnosed, which can have a long-lasting impact on a girl’s self-esteem. Organization is difficult for kids with ADHD. Children with ADHD find it difficult to plan ahead, prioritize their work tasks, and often forget to complete assignments in a timely manner. Putting organization systems in place – and enforcing strict maintenance of these systems – can be extremely helpful. ADHD can cause fine motor difficulties. The ability to control the small movements in the hands and fingers can be especially challenging for kids with ADHD, making it difficult for them to write down and complete assignments. Positive feedback is important. Kids with ADHD are subject to a lot of negative feedback throughout the day, which can be detrimental to their self-esteem. It’s especially important for these children to receive praise wherever possible. Regular exercise and sensory breaks can be very helpful. Children who struggle with hyperactivity need regular exercise and finding ways for them to take breaks throughout the school day can promote greater focus and concentration, while also preventing aggressive explosions during activities a child finds challenging. Don’t sweat the small stuff. As I mentioned earlier, kids with ADHD are subject to a lot of negativity throughout the day, so when it comes to teaching and parenting a child who struggles with attention and impulsivity, make it a point not to focus on the small, inconsequential stuff. Concentrate on the big things and offer positive interactions wherever possible. Crank the tunes. A great impromptu way to help your child burn off energy when you notice he or she is starting to get antsy is to play some music and have a dance party. This is a great way to help children get their wiggles out to help promote focus, and it also helps reset everyone’s mood. Scavenger hunts. I love scavenger hunts as you can make them as simple or complex as you want to, and if you’re looking for activities for kids with ADHD, this is a great option to consider. You can organize your hunt so that it requires your little one to walk up and down the stairs of your house multiple times to help burn off some energy, and also get him or her to climb over items (pillows, beds, the couch, etc.) and squeeze into hard-to-reach areas to make it extra challenging. Fun with masking tape. There are so many fun activities for kids with ADHD you can create with nothing other than a roll of masking tape. You can create a game of indoor hopscotch or tic-tac-toe and devise an obstacle course of straight and zig zag lines your little one has to complete by crawling, jumping, walking backwards, and/or while holding something heavy. When you’re finished, ask your child to unstick all of the tape to help them come back to a place of calm and focus. PRO TIP: I suggest using painters tape in place of masking tape to ensure you don’t damage your floors and/or lift any paint from your walls. Balance boarding. If you need activities for kids with ADHD that don’t require a lot of set-up (and clean-up), a simple balance board is a great option to consider. It helps develop a child’s gross motor and balancing skills while also providing the physical release kids with ADHD often need. Egg races. If you’re stuck at home on a bad weather day and need something to keep your kids active, consider setting up some fun birthday party type of games, like egg races! Start with a simple race across your living room, and then make the game more difficult by putting blankets and pillows on the floor. You can also have your child switch between his or her right and left hands to add an even bigger twist and keep the game going! Fun with balloons. Blow up a few balloons and let your child hit them across the room, or take it a step further by setting up a game of indoor balloon volleyball. You can also grab a couple of rackets and organize a game of indoor balloon tennis. The possibilities really are endless! Jump rope. If you have a big enough area with tall enough ceilings, jumping rope is high on my list of recommended activities for kids with ADHD. It’s portable, fun, improves coordination, and burns off a lot of steam! Hula hooping. Hula hooping offers a great – and inexpensive – core workout the whole family can participate in (did you know they sell weighted hula hoops for adults to help aid in weight loss?). Challenge one another to see who can keep their hula hoop in motion the longest, and if you have several hula hoops (you can buy a pack of 6 pretty inexpensively from Amazon HERE), you can use them to setup obstacle courses. Bouncing on a trampoline or exercise ball. No list of activities for ADHD would be complete without a trampoline and exercise ball! Jumping obviously helps kids burn off a ton of steam, and I love that each of these props offer inexpensive ways for little kids to get their wiggles out when they’re stuck inside. You can keep it simple by having your child jump on an indoor trampoline and/or bounce on an exercise ball, or you can get creative. Have your child alternate between the 2 activities for a count of 10 to keep things interesting, ask your child to roll and/or kick the ball across the floor, or have your child lie on his or her tummy on top of the ball and see how long he or she can remain balanced without holding onto anything. Obstacle courses. If you’re feeling really inspired (and desperate, LOL), setting up several gross motor activities into an obstacle course can be a lot of fun when you’re stuck inside. Get creative with pillows, masking tape, an exercise ball, hula hoops, jumping rope, an indoor tunnel, and any other props you have lying around the house. Extracurricular activities. Group activities like martial arts, gymnastics, boy/girl scouts, and music lessons are all great activities for kids with ADHD. Not only do they help children rid themselves of extra energy so they can focus, but they also develop socialization and gross motor skills while also improving things like impulsivity and self-control. Independent activities. Since kids with ADHD tend to be delayed with their gross motor development and often struggle with self-control and socialization, group activities like the ones above may be a challenge. If this sounds like your child, consider getting him or her involved in outdoor activities and sports he or she can do independently, like running, swimming, or riding a bike. Trips to the park are also a great idea, and there are lots of games you can play together as a family to help burn off some steam, like tag, soccer, or a good ‘ole game of catch. Scavenger hunt. As I mentioned above, I love scavenger hunts as you can make them as simple or complex as you want to, and if you’re looking for activities for kids with ADHD, this is a great option to consider for both indoor and outdoor fun. If you’re outside, try to organize it such that your child has to engage in multiple types of movement, like running, jumping, and skipping to maximize the amount of energy he or she burns off. Trampoline fun. While indoor trampolines and exercise balls offer a great way for kids to get their wiggles out when they’re stuck inside, an outdoor trampoline takes things to the next level as there are so many fun things you can do with a large outdoor trampoline. One idea is to play a game of catch while your child is jumping and you are stationed outside of the trampoline. Another idea, which only works if you have multiple jumpers, is to have one person sit in the middle of the trampoline with their knees tucked close to their body while the rest of the crew jumps in a circle around that person in an attempt to get him or her to move. Household chores. There are lots of mundane household tasks that can be turned into fabulous activities for kids with ADHD. Washing the car, watering the grass, raking the leaves, and shovelling the snow are all great ways to get your kids involved around the house, allowing you to spend quality time together while still knocking things off your never-ending ‘to do’ list and getting a little physical activity in to boot! Bubble blowing contest. Blowing bubbles is fun for kids and adults alike, and as someone who suffers from anxiety, I love that it helps to regulate our breathing when we’re feeling anxious or stressed. Challenge your kids to a bubble-blowing contest to see who can blow and/or pop the most bubbles at one time! ‘I Spy’ walk. A fun way to turn a walk around the neighborhood into a fun family activity is to play the game ‘I Spy’. Take turns describing the things you see to one another to help your child exercise his or her descriptive language and cognitive skills while also stretching your legs and getting some energy out. Jumping in puddles. Unlike adults, kids don’t seem to be bothered by rain, and throwing a raincoat and some rain boots on your child and letting him or her get messy and muddy may be just what he or she need to burn off some steam on a bad weather day. Water balloon fight. If you’re looking for activities for kids with ADHD, a water balloon fight is SURE to be a hit, and I love that it doubles as a fun way to get kids to practice their throwing skills! 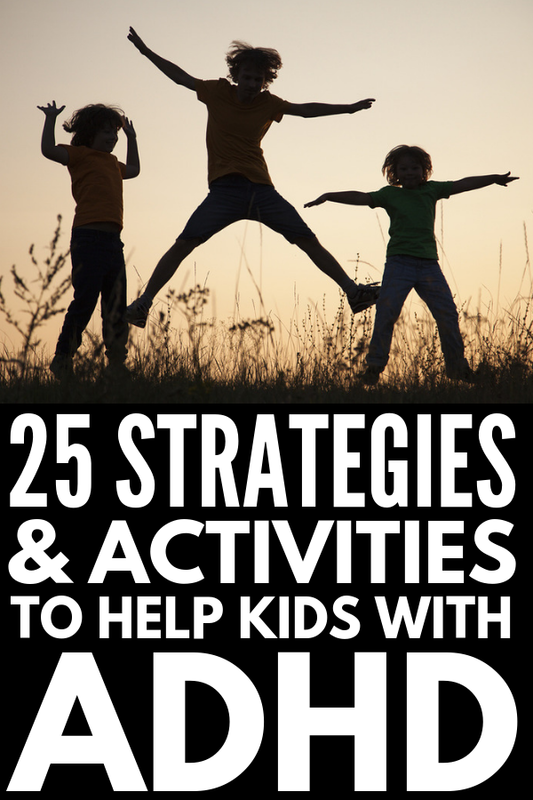 I hope this collection of activities for kids with ADHD inspires you to find ways to connect with the exceptional kids in your life in a positive and meaningful way while simultaneously helping them burn off some steam for greater focus! If you found this collection of activities for kids with ADHD helpful, please share this post on Pinterest! And if you’re looking for more ways to have fun with your kids, please follow our Kids board where we share all kinds of fun ideas we find each day!